From the very beginning of its fourth season this past October, The Walking Dead has been sitting unplayed on my DVR, taking up a sizable amount of real estate. I've been wondering what to do about it: either finally sit down and go through the season, or delete it altogether. This past weekend I decided it was time to face some things, and let The Walking Dead stop haunting me (I know that won't make sense to most readers, just trust me). I suppose I should admit at least a little curiosity at how this season would go, after Season 3 ended with the survivors of Woodbury coming to the prison and the Governor going Lord-knew-where into the Georgia wilderness. 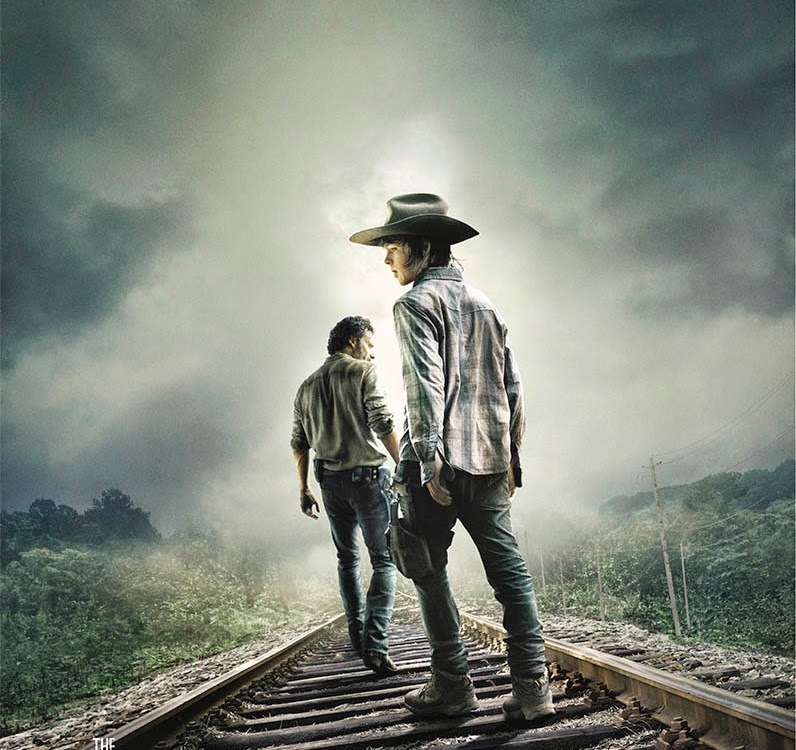 I'm glad that I did choose to watch, because The Walking Dead's fourth season turned out to be some of the most powerful storytelling that I've ever seen from the television medium. The season unfolded across three arcs, each well-contained without feeling especially episodic. The sickness brought the first serious trial to face Rick and his community, and also some of the show's most gruesome moments in its entire run. And then the Governor returned: psychotic as ever. If there is one thing that could have been better with this season, I would have much enjoyed it if the Governor received an extra episode or two: let him really build up his army and get re-established as the biggest villain of the series so far. But when at last he launched his assault on the prison, you just know that AMC nearly busted its budget to make that scene happen. It was stuff you'd expect from a high-dollar Hollywood blockbuster, not network television. And then came the road to Terminus. Watching the survivors, now split up, keep going and trying to fight the odds against the dead and the living. And struggling against their own inner turmoils. You know what I'm talking about, if you've watched this season. I posted on Facebook as I let the series unspool and some friends told me that there was worse... much heartbreaking worse... that was still to come after the prison assault. That I had not seen how bad it gets and that one episode especially was going to bring the tears. Yeah, you know it all right. It was the episode titled "The Grove". I watched it last night. And I had to stop right there, because nothing I had seen on television ever before left me so numbstruck with horror and shock and disbelief. It got to "that scene" and all I could think of was, "No, they aren't going there. AMC is NOT going to do this. Carol is NOT about to do Of Mice and Men on that little girl." Was she right? A friend and I were discussing it today. He asked me what I would have done in that situation. I had actually thought about that after watching "The Grove". And I think... I think... that if it were me, I would have waited until Lizzie was asleep, and then leave with the baby and everyone else. Let Lizzie wake up the next morning to find everyone gone but be left with a pistol and several rounds of ammo. Give her at least a chance to live! And that way she would not be a threat to the group anymore. I thought that would be the best for everyone. Except that Scott (my friend) raised a very valid point: that how were we to know that Lizzie wouldn't join up with another group of survivors, and be a threat to them? I can see that. And one also must be reminded that Lizzie was very, very far gone. It went way more than simple denial about the walkers, about how the world had become. There was going to be no reaching her. No therapy for her. No medication. She was pitiful, she was helpless. But she was also too weak in all of the wrong ways. And after she killed her sister (and was poised to murder Judith), her weakness crossed the line into a very dark place in terms of what was right for the group. Because how could the group possibly trust Lizzie? How could anyone? There was no clean way out of it. I think Carol knew it. And she knew that every day for the rest of her life it was going to haunt her. I wish now that I had watched this season during its first run, because the discussion of "The Grove" alone was no doubt fascinating reading. How many other television series leave the viewer questioning his or her sense of morality? Too few, in this blogger's opinion. Looking forward to catching Season 5 when it airs.